Of course we with any season we all start out talking about the weather, this day was no different. It is is quite cold out where I am this day it is -5 when we started talking which made the time great because I love to be in the warm house when it is that cold. Me: How is the weather there? Me: haha, I so wish I could have taken french in school. That is like a dream of mine! What other hobbies do you have? Justine: The big one is scuba diving. Since I am over 60, this is a significant achievement. I can barely walk with the wetsuit, air cylinder and weights, but as soon as I get in the water, I'm in heaven. 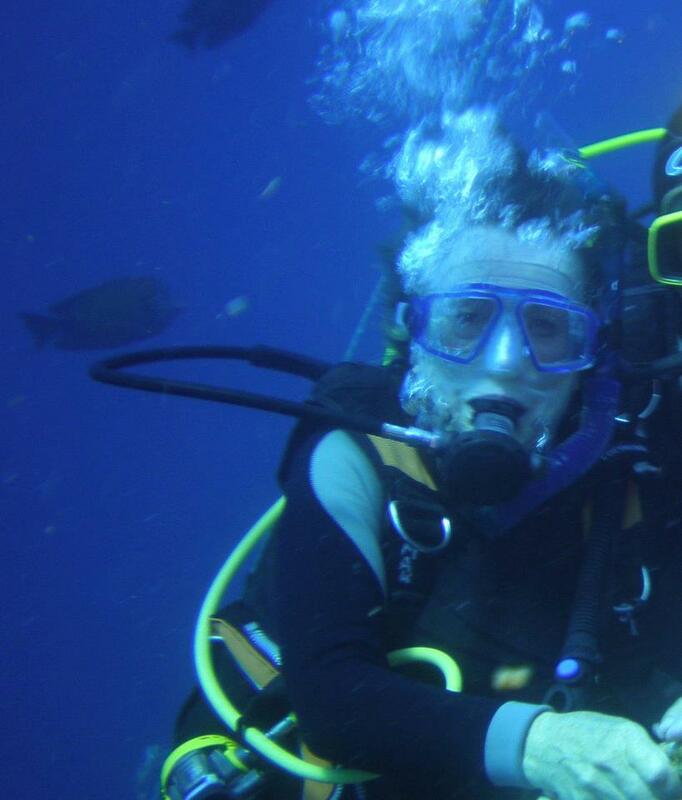 The diving here in Belgium is nothing, but I go every year to the Red Sea. Me: Oh wow! That sounds exciting! Have you ever found anything cool? A Ship or a Mermaid? Justine: Well, no mermaids, but I have been down to several wrecks. The most famous one is the Thistegorme about 100 feet down and chocablock full of war material. Tanks, trucks, airplane parts, unexploded munitions. You really feel like Jacques Coustea. Me: How do you get so deep lol, I feel as if I want to cry when I am swimming in a pool and try to go to 12 feet. Do you train? Justine: Well, you DO have to overcome a natural claustrophobia, but that is what training is all about. Plus, you come to trust your equipment and your safety training and,most important, your colleagues. Me:I was a lifeguard lol.. I think I am more of a saver not a go under person ;) lol. Justine: Good for you. We need savers too. Me: Tell me about your writing. What started your love for writing? Justine:I don't suppose I’m much different from most other published writers. I wrote always. Me: What was your first story about? * not book just story* that you can remember? Justine: After seeing a movie about Hannibal (with Esther Williams as the love interest) I wrote a cartoon book with a similar story, only the woman was the heroine. And I started lots of little stories throughout childhood. I grew up in the tenements of NYC and lived in my imagination. But I am not so vain that I think my life was exceptional. I think most people who end up as writers (and who keep on writing) also live and lived a great deal in the mind. Me: What was your first book? And what did you feel when you finished it? Justine: I was a prof of literature for about 17 years, and had to write to keep my job. My first book was a scholarly treatise called "Salvation in the Secular." A dreary analysis is modern German literature that was read by perhaps 20 graduate students. But writing it DID teach me how to discipline my thinking. So, 30 years later, when I wrote The 100th Generation, I knew how to put down a string of ideas and scenes and keep the reader's attention. Keeping the reader's attention is sort of what popular fiction writing is all about. It's entertainment, pure and simple. It can be simple and trashy, or a bit more elaborate and thoughtful, but still a bit trashy.It MUST entertain, or you're out of the business. Me: How do you feel about your latest book? Do you feel everything went the way you wanted it to go or will there be a squeal? Justine: That one was an emotional one. It was based on the actual tragedies of the relatives (parents in one case, aunt in the other) during the Belgian resistance in WWII. I set about fictionalizing the events while keeping as close as possible to the real story and using real names. No, I don't want to write a sequel, but my current work (since the Resistance book is with the printer now) is about women in the Soviet Air Force. Another kind of Resistance, of course although I should add, both books have lesbian romances as subplots. Me: What are you currently working on and when can we expect it out? 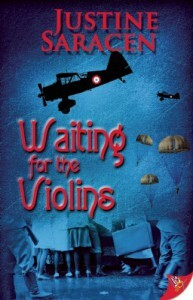 Justine: I hope people will first pay attention to "Waiting for the Violins" which is due out in March. That is the one about the Belgian resistance fighters. I've only recently started doing research and rough scribbling on the next one, called "The Witch of Stalingrad" about an American journalist going to Russia and falling in love with a Soviet Pilot (based on Liliia Litviak, a real heroine pilot in WWII) The research is riveting and I have just spent all of today reading about my own father who was a radio operator in the Merchant Marines during WWII. Me:What is your new book about and when/where can we buy it? Justine: All my books are available through Bold Strokes Books or through my website. Thank you Justine for taking the time to chat with me. It was a great experience to learn about your books. I am looking forward to picking up your book coming out in March.